Make the expansion of Robson Square a reality – help needed! UPDATE (Jan 30): City Council has deferred consideration of this item until Wednesday, February 13, 2019. But don’t wait until then to show your support for Robson Square. Please read on and lend your voice to the discussion! There are a number of , Wednesday, January 30. These include support for extending the Broadway Subway to UBC (good idea! ), and the public engagement process for a the potential Granville Bridge Greenway (also good, provided a full range of design options are explored). There’s a third, very important, item up for consideration: funding for the creation of a permanent plaza at the 800-block of Robson Street. This is the very popular, and extremely well-used space on the south side of the Vancouver Art Gallery – and securing the needed dollars to make design a reality is critically important. 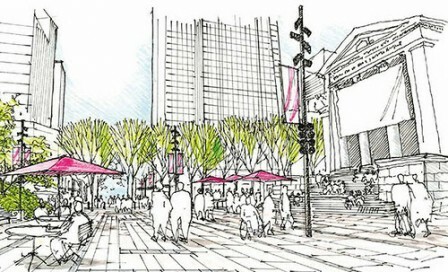 We know that many of you support the idea of a permanent plaza at the 800-block of Robson. The pathway to creating a permanent plaza at this site has been a long one, and we are very close to seeing this become a reality – but we need you to take a few minutes of your time to help to make it happen. 2017-2018 – Design work continued; interim design installations and + programming introduced in advance of a refined design. Proposed final design and build anticipated to begin in 2019. A lot of progress has been made over the past nine years; however, in December last year, Council voted to defer funding to the Robson Square project in the midst of discussions on the City budget. It was a decision that caught many of us by surprise – and was made amidst a variety of other discussions. In January, the VPSN wrote to Council asking that they revisit this decision and encouraging them to expedite the process of completing the plaza. Our rationale: after this many years of discussion, testing ideas, temporary programming plaza uses, and planning and design for a permanent plaza, we need to keep the momentum going and finish the project. We wanted to remind them of the importance of this popular public space. Robson Square and the 800-block is the public space ‘heart’ of Vancouver. So let’s complete this important project so that it can be properly enjoyed by residents and visitors alike. City Council will be re-considering the funding question tomorrow, Wednesday, January 30, 2019. We take this as a positive sign, and think that there is a good chance that Council will be willing to revisit their earlier decision. However, to help the case, it is important that friends of public space, such as yourself, send a strong message to Council to support this initiative. Take 5 minutes to write a note to Council letting them know that you support the recommendation of City staff to (a) continue with delivery of the 800 Robson Plaza; and, (b) allocate capital funding for the project. (You can read the full recommendation and related details in the accompanying staff report – and you can also read our original letter in the appendix). Sign up to speak to Council and share your support in person. You can register to make a short (up to 5 minutes) presentation to Council by writing or calling the City Clerk’s office. It’s important that we get as much support as possible for this, so if you have a few minutes this weekend to do one or both of the above, that will go a long way to ensuring that the Robson Square plaza project moves ahead. Thank you in advance for helping to champion the importance of a permanent plaza on the 800-block and an expansion of Robson Square!